If you are looking for a nice tool for creating coming soon page or maintenance page, you are at the right place. I have carefully handpicked 5 absolutely useful WordPress maintenance mode plugins for you. Already scanned through my list? You must be wondering why it looks different to other lists you have seen. It should be clear from the headline – it’s a list of useful plugins, not the so-called best plugins. I got the idea as I came across several plugin roundups with similar items in the list. Most of them have listed the maintenance plugins which are highly downloaded from WordPress.org and the ones that appear on the first page of Google search results. That sounds quite logical but you can’t ignore underdogs. Yeah, there may be many tools and plugins which are absolutely awesome but often overlooked. When do I need a maintenance mode plugin? You need a maintenance mode plugin if want to make some edits on your existing WordPress website files or creating a new website which is not completely set up to go live. Maintenance mode WordPress plugins are great tools for handling downtime during site maintenance. Firstly, let’s discuss the case of existing website. Suppose you have a live website with a remarkable number of daily visitors but need to make some big changes that may cause your site downtime. As a result, your site visitors may eventually land on a broken page/ error page – bad luck to you! Besides, the 503 service unavailable responses can affect UX as well as rankings over time. But a quality maintenance page plugin can save you in such a scene. You can easily create a good-looking maintenance page and notify your site visitors that your site is under construction and will be live soon. Talking about the second case, it is more like collecting pre-launch impression for your coming soon website. You may already have a registered domain, installed WordPress but it may take months to complete the whole project and push it online. If you can’t wait to see many things happen before your site is ready, creating a coming soon page is a great idea to go. Build a beautiful coming soon/ maintenance page and start reaching out to your prospect audience. 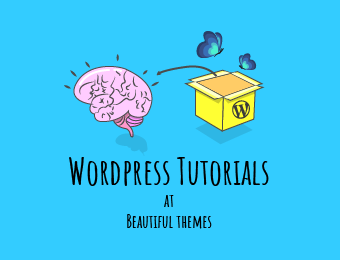 In this post, I will show you 5 awesome maintenance mode WordPress plugins which will enable you to create a beautiful coming soon page. Maintenance Page is an incredibly useful free WordPress plugin for creating maintenance/ coming soon page. The plugin comes with some great features while being free of cost. The plugin features fully responsive design, custom logo upload option, subscription form, social icons, custom CSS etc. It is simple and user-friendly – created to make the users’ task easy. You can easily install the plugin and customize it with your custom content. As you install the plugin, click on the ‘settings‘ and you will come across a page like below in the image. It has mainly three tabs – General, Social Icons, and Subscribe. You can activate maintenance page and customize the page as per your wish from the ‘general settings’. Besides, there are options to add a logo, heading title, text message, background image and color, font color, link color, and add custom CSS in the general settings. The plugin also lets you add your social media accounts and display the social icons beautifully on the maintenance page. To add social media icons, go to the ‘social icons’ tab and simply enter the social media profile URLs. Besides, the plugin allows you to add subscription form in your coming soon page with which you can collect user emails. It has an option to download the subscribers’ list as CSV. It is a feature-rich responsive coming soon plugin for WordPress. The free plugin offers some really cool features that enable you to create a complete maintenance page for your site undergoing construction. The major highlights of this plugin are full-screen slideshow background, unlimited color scheme, countdown timer, 5+ social icons, subscription forms etc. 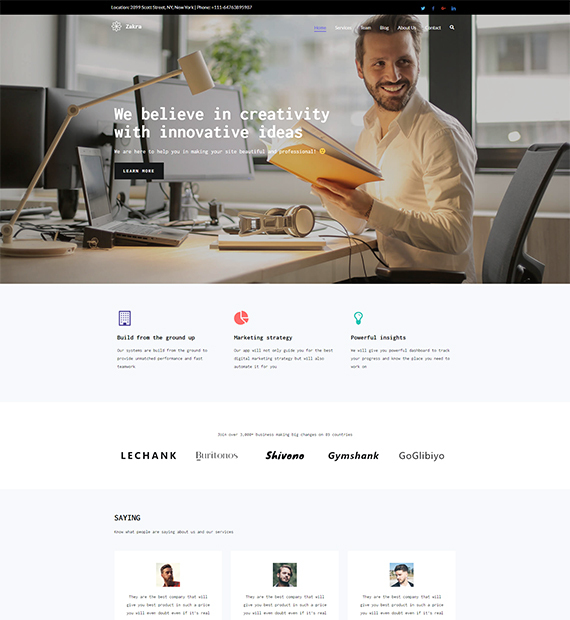 Built on Bootstrap3 and HTML5, it is compatible with any WordPress theme, fast, robust and SEO friendly. Customizing the plugin is easy. As you activate the plugin, click on ‘settings‘ and you will see ‘Responsive Coming Soon Dashboard’ like below in the screenshot. Put a check on ‘Enable Coming Soon Mode’ and click on ‘Save Changes’. Next, you can add a custom logo, headline, description, and page button text in the ‘settings’. 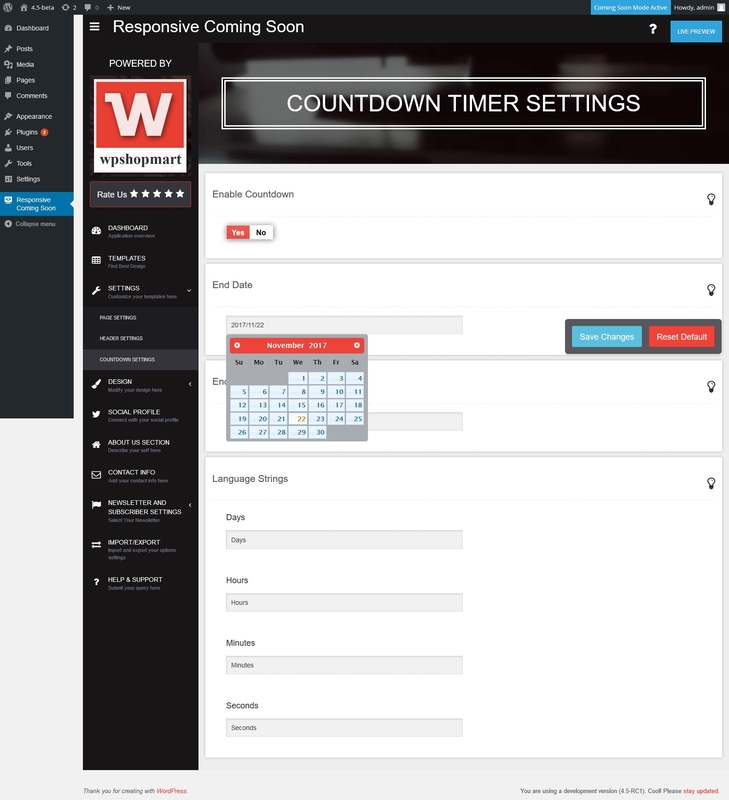 You can also find ‘Countdown Settings’ where you can set end time and end date to signify the date of your site launch. You can add up to 5 images in the background slideshow and make coming soon page attractive. Else, you can also use a static background image or color. The free plugin allows you to display 2 additional pages (About Us and Contact Info) along with the main home page on the same screen. The next plugin in my list is 8Degree Coming Soon Page which focuses on making the coming soon page look sleek and elegant. It has a neat and clean backend as well as frontend design which ensure a nice user experience. 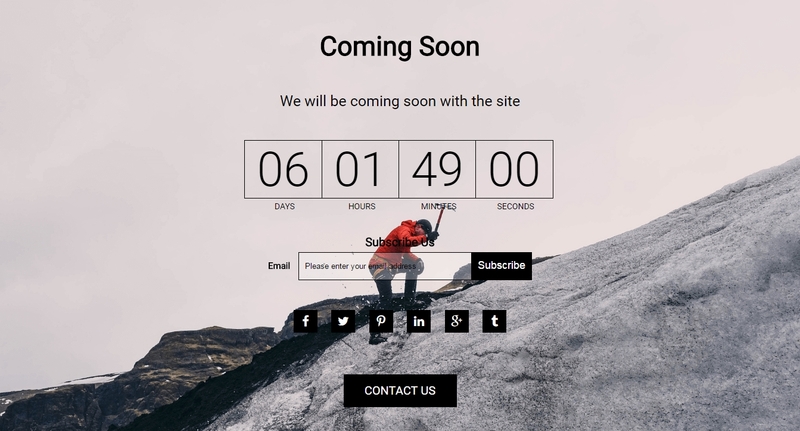 With options to add a countdown timer, subscription form, social icons and contact form, it is a complete tool for a coming soon page. You can find multiple layouts for timer layouts, subscription form layouts. Furthermore, you can easily customize the color of font and background for each section. First, enable ‘Maintenance Mode‘ from the ‘general settings‘ and it will show you option boxes for customizing. You can insert content/ make changes on header section, description, subscription form, social networks, contact us and countdown from there like in the screenshot below. Next, you can change the ‘design settings’. You can use any color of your choice for the header text, description text, page background and all the other elements in the page. Besides, the free plugin offers two different design layouts for timer section and subscription form. You can choose any one. Furthermore, it has ‘extra settings’ tab from where you can disable the maintenance mode for admin users and make SEO settings. It is fully responsive that looks great on any device. The main features of the plugin are custom logo upload option, unlimited color configuration, Google Analytics field etc. Customizing the plugin is really easy – no coding is required. A layman can do the job. You can change the page title, headline, description, footer text, logo, background image, color and customize the font settings etc from the same place. In addition, you can add custom CSS from the available field and make the coming soon page more attractive. If you want to exclude any pages or posts from the maintenance mode, you can do that simply by selecting the page or post and save settings. Last but not the least IgniteUp – Coming Soon and Maintenance Mode is an awesome maintenance plugin for WordPress. It offers some great features like in a premium plugin – lets you create a perfect coming soon page in no time. The free plugin is fully responsive that adapts well to all devices. Besides, it is compatible with almost all the WordPress themes. It has an advanced backend from where you can enable/ disable the maintenance mode, skip page for the admin users, skip page with secret URL or IPs in the ‘general settings’. Another tab ‘Template options’ allows you to set launch date and time, background font and color, title text, subtitle text, description text etc. You can configure the color unlimited – use any color for the text, button background etc. To add and customize subscribe area, social icons, and contact form, you have to go to ‘Common Options’ tab. If you have any comments and feedbacks, feel free to write in below. If you are using any of the plugins in my list and want to share your experience, I would highly appreciate that. I think it will help you quickly pick a plugin and get you coming soon page ready. All these maintenance mode plugins in the list are available in both free and premium versions. Therefore you can always try the free version and later upgrade to premium for advanced features. You may also like to view our collection of best WordPress plugins and WordPress Page Builder Plugins. Helpful article, thank you, I purchased #2 Coming Soon Page and Maintenance Mode. Be aware the contact and subscribe forms may not function. There is a jQuery error in their Maintenance mode that prevents the contact and submission forms from operating correctly. Customer support says I need a SMTP plugin, but I see the 503 error in the web developer’s console of my browser, so the error is clearly on their side. I’m going to ask for a refund. Too bad it doesn’t work, the features are good.